The Supervisor of Elections, Mohammed Saneem has clarified what the next critical step is in the electoral process when it comes to the tabulation of the final results. 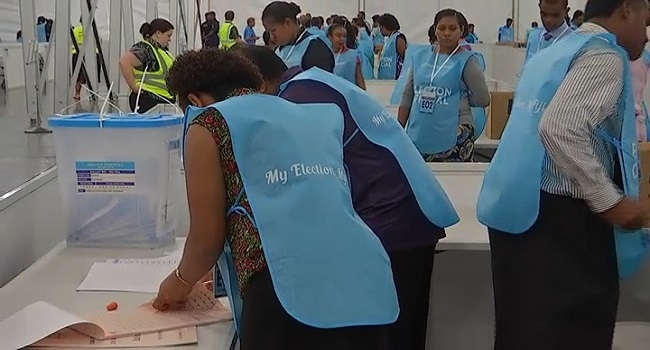 With provisional results completed on Wednesday night, the count – the SOE says continues with the expectation all figures for the 2170 Polling stations will be finalized on Sunday. Meanwhile, 7498 voters that missed out on casting their votes on Wednesday will now be able to do so tomorrow at all 22 affected Polling Stations. Saneem adds polling stations for these venues which were rained out on Election Day will on Saturday be open from 7.30am to 6pm. The Korovou area, number one, Delaikado FEO Shed, number two Natadrave FEO Shed, number three, Nasinu Community Hall, number four, Turagabeci Primary School, number five, Lodoni Primary School, number six, Naivicula District School, in the Rakiraki area, Korotale Mandir Hall, Namuaniwaqa Primary School, Mataso Primary School, Rewasa Community Hall, Nausori Technical School, Visama Sanatan Dharam Primary School, Naqeledamu Village School, Naqeledamu Village School, Nukutocia Village Shed in Levuka, Central Division and Naisogo Settlement FEO Ground Shed, Shantikettan Primary School. In addition to Navuniivisau Community Hall, Krishna Janaradhan School, Logani Community Hall, Matacaucau Community Hall and Gram Sangathan School.